All of our puppies are $3000 (plus 12% provincial sales tax). This price includes a 4 generation pedigree, vet check, de-worming, vaccinations, microchip, spay and neuter, a toy, a puppy blanket with mommy dog's scent, a book with puppy raising information, collar, and a 3 year Health Warranty. 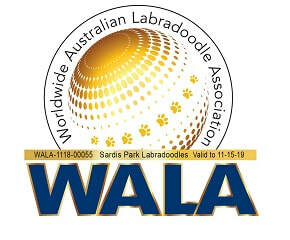 We are proud to say our puppies are registered with both the Worldwide Australian Labradoodle Association and the Australian Labradoodle Club of America. The first step is to fill out the Puppy Application. We will get back to you within 24 hours to let you know if your application is approved. If your application is approved, the next step is to send your $500 deposit to reserve one of our puppies. Then wait for your puppy birth announcement! We will send weekly updates and pictures to keep you informed every step of the way. The remainder of the purchase price ($2860) is due before the puppies are 6 weeks old. Puppies go to their new families at 9 weeks of age. You can come pick up your puppy from our home or we can deliver your puppy to you if you live in the lower mainland. We can also sometimes fly your puppy to you if you live too far away to come to us. We choose your puppy for you based on the best temperament fit for your family. When the puppies are a few weeks old we ask for detailed information about your family and what you are looking for in a dog. Then as the puppies' temperaments develop we match them to each family based on temperament. Our puppies live in our home, right in our living room to be exact, and we spend a LOT of time with them. We know them very well. When you come for a visit you might see a puppy who looks mellow and snuggly but you missed his wild run around play session just before your visit and really he is usually the most active puppy in the litter. It is very important to us that you are thrilled with your puppy forever. In our experience, people are happiest with their puppies if they fit perfectly into their families. You may fall in love with the big, rambunctious, chocolate girl from her pictures and visits when really the calmer, small cream boy would be a better match for you. We take our role in selecting your new doggy family member very seriously. We are sure you will fall head over heals in love with your puppy and cherish her for the rest of her life. Sardis Park Labradoodles reserves the right to retain, sell, or trade future breeding prospects before assigning companion or assistance dogs to families on our waiting list. Sardis Park Labradoodles also reserves the right to refuse to sell a puppy at any time, to any person, at our sole discretion. 1. The Breeder guarantees the puppy is in good health at the time of delivery. The Buyer has three days to take the puppy into a veterinarian for an examination. If the puppy is found to be of poor health the Buyer has the option of returning the puppy to the Breeder for a full refund or keeping the puppy and the Breeder will reimburse for all veterinary costs, up the purchase price, related to the pre-existing condition. 2. The Breeder provides a warranty for three years after the puppy's date of birth against any serious genetic disorder that affects the dog's quality of life. Should a serious genetic disorder be discovered, the Breeder will offer a replacement puppy from the next available litter or refund the original purchase price (breeder's choice). Your dog does not need to be returned to us. All veterinary records must be supplied to the Breeder. In the case of HD the Buyer must provide documentation from PennHIP or OFA. In the case of cataracts or PRA the Buyer must provide documentation from a veterinary ophthalmologist. 3. The Breeder reserves the right, at the Breeder's expense, to have the dog checked by a veterinarian of the Breeder's choice before offering a replacement puppy or refund. 4. The Buyer will provide the dog a caring and loving home. 5. The Buyer will take the dog to a veterinarian for an annual check-up and all preventative treatment recommended by the veterinarian will be followed. 6. The Buyer will feed the dog only a premium quality dog food. The Breeder recommends Acana, Orijen, Go Natural, Taste of the Wild, or a balanced raw diet. Pet food sold in grocery stores does not constitute a premium pet food. Fresh water must always be made available to the dog. 7. The buyer will not allow the dog to become overweight or allow repetitive, rigorous exercise, especially during the first year of development. 8. The Buyer will take the dog to at least one level of obedience training. 9. The Buyer will contact the Breeder if the Buyer can no longer look after the dog at ANY point during the life of the dog. The Breeder will find the dog a good family to live out his or her life. 10. The Buyer will sign and return a copy of this Contract and Health Warranty within 10 days of receiving it from the Breeder. Failure to do so will void this Contract and Health Warranty.